As some of you already know, I recently developed and released a brand new lighting workshop called Creatively Simple Lighting. In that workshop, one of the core foundations of what I teach is how to get creative with simple lighting and simple lighting doesn't get any simpler than when you use Speedlights. At their most basic, Speedlights can simply sit on top of your camera and illuminate whatever is in front of you. If you want to get a little more creative however, the first thing to do is to get that flash off your camera and step into the vast world of off-camera flash. Off-camera flash is where it gets interesting and it's very easy to throw a cheap softbox on your speedlight and take some pleasant yet fairly basic shots. So how do we make it a little more engaging without spending a fortune? Well, as part of my workshop I wanted to prove that all the setups I was teaching could be achieved with a couple of Speedlights and some very basic modifiers. The following article is the result of me dusting off my Speedlights and playing with some homemade modifiers to see if I could create some engaging and creative effects without it costing me a penny. About 20 years ago when I was at Uni studying photography (yes, I'm that guy who actually studied a course he eventually got a job in) we were pretty poor. In fact there was a group of three of us that always hung out and we helped each other do shoots but only one of us had a Speedlight. We all used that single Speedlight but we had no real modifiers to speak of (unless you count the Rizla [cigarette paper] over the end to act as a diffuser 'modifier') so we had to get creative with how we modified the light that emerged from that poor little overworked Speedlight. Circa 1998: Behold, the power of a single Speedlight and a Frosties cereal box at work! Now remember, it's pitch black and the middle of the night in place that we weren't technically supposed to be. Also there were no mobile phones back then to act as lights (I know right?! I'm that old - NO MOBILE PHONES!) so with no auto focus on the camera, focusing in the dark was almost an impossibility beyond judging the distance and then adjusting the lens accordingly. Plus, there's no modelling bulbs on the Speedlight so Chris had to use his best guess that he was pointing his Frosties box in roughly the right direction. PLUS: It was an old film camera - NO BACK OF CAMERA IMAGE! I think I shot an entire roll of 24 frames of just this setup and hoped we had at least one frame that was passable. But we wouldn't know until tomorrow. Looking back on that now, I learned about and worked through so many problems on that one little shoot and for that I'm so grateful I grew up learning with the madness that is film photography. It forced us to be so creative every single time we picked up a camera where we now may be guilty of relying on post-pro just a little too much a little too often. So fast forward nearly 20 years and I pick up speedlights once again to prove a point. It fact it had been so long since I'd used Speedlights that I actually started the shoot with no batteries and had to run out and get some. I was certainly a little rusty with using them. But if Speedlights are so versatile and simple to use, why did I ever leave Speedlights in favour of strobes to begin with? Essentially Speedlights are fantastic but they do have limitations and in the end your skill with lighting will exceed what they can offer you. I liken using Speedlights versus strobes to a master chef making a fine meal. The chef can either make the meal with fresh meat and vegetables from a country market or they can make the exact same meal from ingredients bought from the corner store. Both results will produce the same meal but one will definitely taste better than the other. The result is only ever as good as the ingredients. 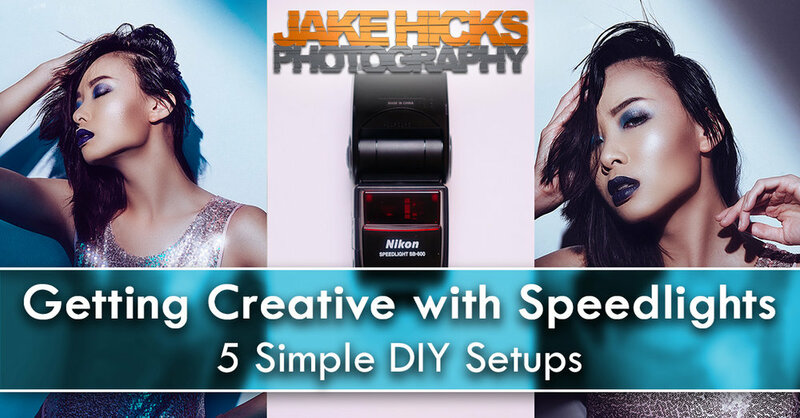 So now that we're aware of what Speedlights can do and the limitations they have, let's take a look at some of the creative ways I used them without spending any money. I'm sure you all know the type of light that a Speedlight produces, its pretty hard due to the nature of its size. If you aren't aware of what I mean by 'hard' light then I simply mean that it's quite harsh and generates a contrasting light. The shadows are very dark and the highlights are very bright so it's not always that flattering or interesting to look at. Let's add some household product packaging into the mix and see if we cant rustle up something a little more visually engaging with very little effort. First off, I got one of those silver tubes you eat crisps out of. I cut the end off and put the Speedlight inside. In this first shot I had the Speedlight quite far into the tube so that I could control the light and stop it from bouncing around the white room. This resulted in some very strong and very clean shadows. A simple silver lined crisp tube with the base cut off and a Speedlight inserted. Normally what happens when you use a Speedlight in a small white room is that light bounces everywhere and you loose some of the contrast. Channeling the light down this silver tube allows you to limit this light from bouncing unnecessarily and results in a stronger shot. The simplest way to engage a viewer is to control where they look. If you can guide their eyes to the focal point of your shot then you automatically create a more engaging image. For this next shot I simply pulled the Speedlight out from the silver tube as much as I could and it created a very clear vignette of shadow around the model resulting in a more visually engaging lighting effect. With the Speedlight pulled further out of the tube I was able to create a vignette of shadow around the model resulting in a more engaging lighting. So can we take the edge off this strong yet directional light? Well thankfully yes and you'll be pleased to know its simple and very cheap to implement. All you will need is your crisp tube lid and a piece of toilet tissue and you're done. 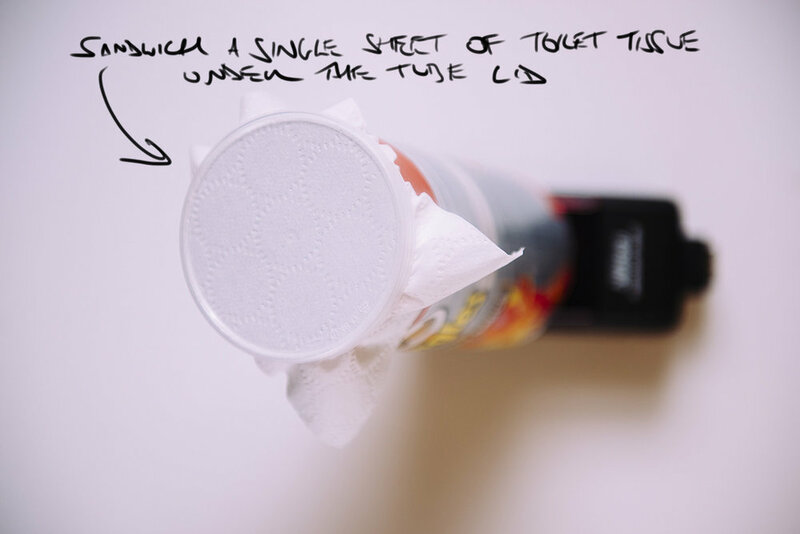 Simply place a single sheet of toilet tissue over the lid and attach it to the tube. It's not classy nor does it look pretty but it is cheap :D Take the edge off your hard lit portraits. The resulting image is far softer than before yet it still maintains a strong directionality. Compare those shadows on the wall behind the model to the previous shots. So with the minor addition of a single sheet of toilet tissue you should see a dramatic difference in the way the shot looks. Pay close attention to how soft the shadow edges are now. Ironically this type of lighting is actually fairly tricky to achieve with strobes. The reason for this is because there's actually a lot of light in the shadows. Look at how bright the shadows are compared to the original shot with no diffusion tissue on the end. The lighting now creates very strong directional lighting but with detail in the shadows thanks to the light spread. Next up I'm going back to my roots of 20 years ago and channelling the speedlight down a cardboard box once again. This next idea, couldn't be simpler. All you need is to find a cardboard box and open up the end and fire the speedlgiht through it. Once you have that in place you can adjust the angle and tilt of the box to create more interesting slits of light and shadow. Adjusting the angle of your box can create different effects and simply twisting it a little will creates slits of light and shadow like this. It should be pretty easy to see how effective and engaging this look can be with a little effort. Plus, remember that this is just a single speedlight and a cardboard box! Nothing fancy here yet its a beautiful looking light. This next step is for those that want to take the creativity to the next step by adding an extra light. This time around we will take the 'Channelling the Light' technique from before, leave that exactly as it but with the addition of a second light and softbox. We can place this softbox where we like but just out of shot will be fine. Before we attach a softbox to our speedlight though, we're going to add a blue gel to it. This will add a whole other dimension of colour and interest to the shot and thereby making it far more engaging for the viewer. Adding a second light can obviously open up a whole new world of creative possibilities but adding some colour to that light can certainly be a great way to go if you want to add some interest. The addition of some colour here completely changes the way the shot looks. With very little effort, an inexpensive softbox and a cardboard box found at home and you can quickly add a lot of interest into your images.